I’m cautiously optimistic about the public’s participation in Ohio State’s Presidential search. Transparency is limited for obvious reasons. The best candidates for the role probably already have awesome jobs, and endangering those wouldn’t build the best relationships for recruitment. This is understandable, but there is still a lot of mistrust on other levels. Some worry that the role will be filled by, say, a buddy of the Board of Trustees, or that the president has in fact already been selected and that the pomp and circumstance of this search is simply that. I haven’t been at the university long enough to be that jaded. Honestly, though, I haven’t been moved to get involved in the process, either. Luckily a couple of the search committee members came to a PPCW meeting so I got a lot more information than I was proactively seeking out. The themes referenced in this document are not at all surprising to anyone familiar with Ohio State. But there are some indicators that outline how these values are prioritized. “Must have demonstrated record of”: The new president cannot not have these qualities. Signifies top priorities. Most everything else is listed as “Must Demonstrate,” without the historical record reference. Not as tangible when you’re looking for demonstrated understanding, commitment, and personal characteristics like “ethical” and “compassionate.” But still stronger rhetoric than Should. Note: it’s a big deal that the president, according to this doc, doesn’t have to come from academia. Other presidential searches don’t even consider candidates from outside of higher ed. It’s good to know priorities for the institution where you work/live/study. Being in one department and only hearing great things about your area, having the Provost visit to say you should be better supported, etc can give you one impression of how your unit is prioritized. Stacking values up against one another and really seeing how choices are made at this level could better explain the kind of activity you see in your everyday work. Having access to these required qualities means we can score the selected candidate on each. If a president is chosen and they have not demonstrated a record of enhancing diversity, for example, we can raise hell about it and have structure to support our argument. This still seems kind of fluffy, I know. You’re all, “So what, little-old-me writes a letter to the Board of Trustees?” But this could help university administrators, government officials and other important decision makers who can work to protect your interests as well. Knowing who is making the selection and what criteria it’s based upon is valuable information that holds people accountable for protecting the interests outlined. The next president at Ohio State could help transform this place into just what you want it to be, maintain some version of the status quo, or wreck it. Staying involved and informed is important, even when transparency seems elusive and power unfairly distributed. This only emphasizes the need for everyday students, faculty and staff to make the best of the resources available to them for priority awareness and accountability. 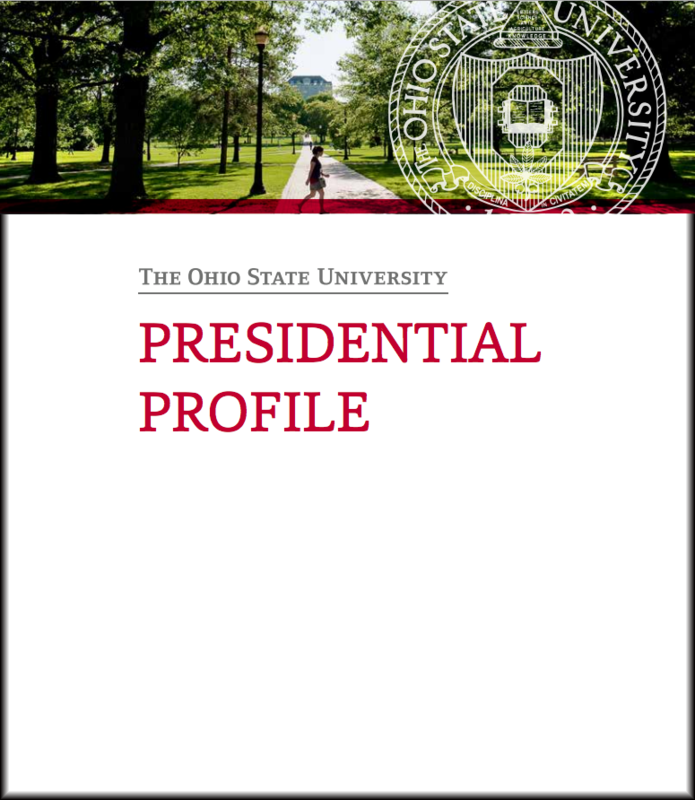 What do you think about the Presidential Profile? Any other nuances or interesting pieces that stood out to you?